It all began nearly 15 years ago, when Toyota introduced Canadians to the Prius, the world’s first mass-produced hybrid. Today, after many years of strong and steady sales growth, Toyota Canada is proud to celebrate the milestone of having sold 100,000 hybrids in Canada. In fact, of all the hybrids sold in Canada since 2000, more than three quarters come from Toyota and Lexus. Toyota offers the greatest variety of powertrains among all manufacturers. There are six Toyota and soon to be six Lexus hybrid models available in Canada. From Toyota, there’s the original Prius, Prius v, Prius c, Prius Plug-in, Camry Hybrid and Highlander Hybrid. Lexus’ largest lineup of luxury hybrids in the world includes the CT200h, ES300h, GS450h, LS600h, and RX450h, which is manufactured by Toyota Motor Manufacturing Canada in Cambridge, Ontario. And coming soon, the Lexus NX 200h will be introduced to Canada. In 2014, the Toyota Prius, Prius c, Prius v and Highlander Hybrid all won awards from Natural Resources Canada (NRCAN) as the most fuel-efficient vehicles in their respective categories. 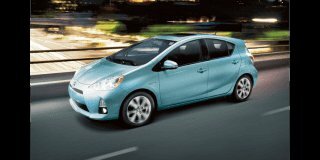 It marked the fourteenth consecutive year that at least one Prius model claimed an NRCAN award. In an annual Reader’s Digest survey, Toyota has been chosen by Canadians for four straight years as the country’s most trusted hybrid brand.